Plow with confidence. Independent trip edges reduce the risk of damage to the snow V-blade if it impacts hidden obstructions, such as concrete curbs, manhole covers and uneven sidewalks. Adjustable, dome skid shoes protect the operator and component. Adjust the blade without stepping into the cold. Intuitive fingertip controls make it easy to configure the V-blade to your tough job from inside the cab. Independent trip edges: Trip edges reduce the risk of impact damage from hidden obstructions, including raised concrete on sidewalks and manhole covers. Intuitive fingertip joystick controls: Choose from five different blade configurations without leaving the comfort of the cab, allowing for blade positioning on the go. Skid Shoes: Domed, adjustable skid shoes provide operator and component protection. Five Blade Positions: Use it as a V-blade to cut a path through deep snow; as a scoop blade to scoop, push or pile snow; a straight blade to pile large amounts of snow; and as an angle blade to push snow to the left or right. 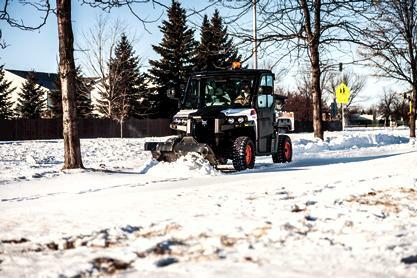 Cutting Edge: High-carbon steel cutting strength delivers maximum snow removal power. The cutting edge is reversible for long wear life. Optional rubber cutting edge available. Flotation Kit: Optional frame flotation kit oscillates blade +/– 10 degrees to improve performance on uneven terrain and follow the contour of the ground independently of the carrier. Applications include snow removal on sloped parking lots, streets, driveways and sidewalk approaches.